This Mike Connolly Miskwish, Campo-Kumeyaay website historical map graphic "Reservation Negotiated in the Treaty of Santa Ysabel 1852 Between the United States and the Nation of the Dieguino Indians" details the 1852 Kumeyaay reservation lands. DOWNLOAD TEXT PDF copy of treaty. This historical San Diego County map graphic is being used by the KUMEYAAY.INFO website in its KUMEYAAY MAPS and KUMEYAAY HISTORY online features. Five more Mike Connolly Miskwish (Campo) Maps may be accessed from KUMEYAAY.INFO. These five maps detail Kumeyaay points of history, the arrival of the Spanish 1769, the Spanish expansion into Kumeyaay Indigenous territory 1798, the maximum extent of Spanish control 1822, the Kumeyaay attacks on the Spanish to regain their lands 1836-1842, the Treaty of Santa Ysabel 1852. Mike Connolly Miskwish, Campo Kumeyaay Map is part of large map historical poster that details the Treaty of Santa Ysabel, 1852, including the 2005 California Indian tribes of the greater Southern California area and northern Baja California, Mexico, the Native American Indian reservations, and contrasts them with the Indigenous Kumeyaay territory of 1769 (gray area). 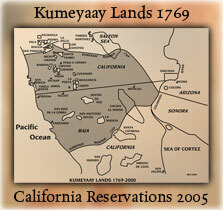 Information to BUY THIS HISTORICAL KUMEYAAY MAP is available on the link.